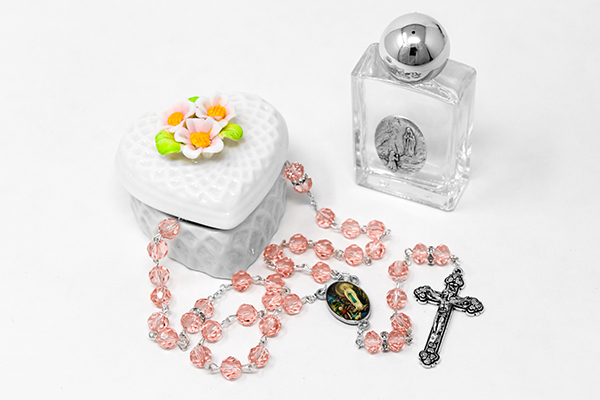 CATHOLIC GIFT SHOP LTD - White Porcelain Heart Rosary Box Gift Set. White Porcelain Heart Rosary Box Gift Set. > Square bottle of Lourdes water, bottle measures 9 cm tall (3.5 inches) and holds 45ml (1.5 US fl oz) approx. >Lourdes strass crystal & Swarovski elements rosary beads, the beads are 8 mm and the rosary measures 18 inches approx. > White porcelain heart rosary box with flowers.